Breathing in, breathing out, a new cycle of life starts. 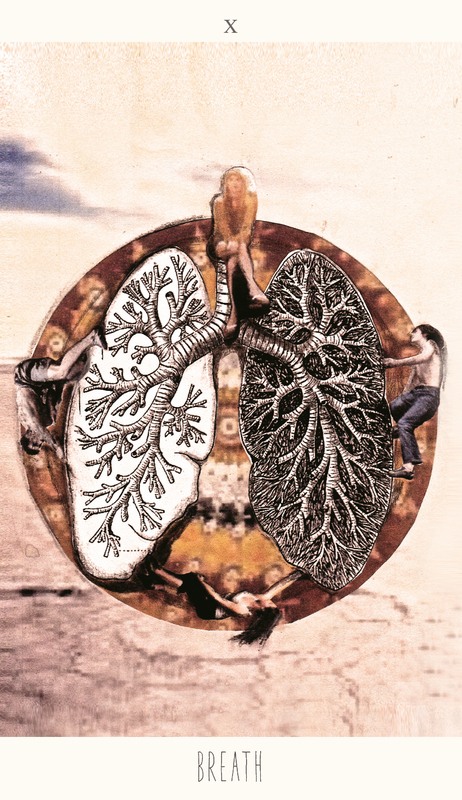 In this card we see a pair of lungs, caught inside the hull of the world, captured in the universe. Four people are sitting or hanging on to the circle, marking the four quarters of the compass. Some are upside down, clinging on for their lives. Another is on top, happily enjoying the view. In Breath everything comes together: material, emotional, intellectual and spiritual powers intertwine to reveal their inner connectedness on all levels. In a lot of spiritual traditions Breath equals the essence, the spirit of Life itself. God blew life into Adam, and depending on the tradition this breath is called chi, ki, prana or simply energy. In Breath, Hope’s journey pauses for a moment, charging up for the creative release of Play to guide us into the second cycle of Hope. Through the energy of Breath we are connected to the world and all the beings in it. Breathing is what makes the spirit of the world circulate through us; it is our source of movement, of transformation, of connection. How we breath changes our attitude to the world, makes us more or less porous to what happens around us. Through breathing we can overcome our fears, deal with pain, enter into ecstasy, and become perceptive of our relation to the world. It is this breath, this life energy, that moves through all the world’s beings. And the moment we become aware of this inter-being, of our shared dependence on the breath of life, we also become aware of the karmic nature of our existence. Since we are made up of the same stuff as all creatures and all things that surround us, we now recognize ourselves in every landscape, in every other being we encounter. In that sense we come to understand that every move we make is connected, is moving beyond our individual scope, to touch another being into movement. And the other way around. This means that any action we breath into the world carries in itself the power, as well of the risk, to return to us in our next intake of air. Every good or bad-intentioned action we send into the world, will enter into the ecology of things and produce change in the intricate fabric of relations that hold it together. In this process we also understand our own vulnerability, and our helpless dependency on the actions of other beings. On an economic level this becomes clear in the interdependency of the North and the South within f.e. global food industries. By creating an economy of unequal exchange, oriented towards fulfilling the immediate needs of the Western customers, the rich countries have not only come to destroy the self-sustaining power of the local economies in most of the South, causing famines, poverty and violent uprisings. But it has also created a derailed chain of middlemen that refine and upgrade the food products to such a degree that they become toxic, lead to serious diseases and implode the Western local food markets. Just like the self-serving ideology of the West has caused a severe religious dichotomy, alienating big parts of the world in Freedom wars, that mostly sustain the freedom of the ‘free’, but heavily subsidized free market. Which results in an ever-rising accumulation of poverty in the cities, violent outbreaks of xenophobia, and the rise of the popularity of reactionary populist politics. Therefore it is important that we understand, not only intellectually but through personal experience, that we are part of a global and interdependent reality. If we understand this, we are no longer capable of making a clear distinction between the ‘I’ and the ‘Other’, nor between ‘We’ and ‘Them’. If all things and all living beings are connected, the happiness and suffering of the other becomes impossible to ignore. Not only because this is amoral, but also because it is unwise.In a reading this card tells us that our individual luck or sorrow is relative to the turning of the world’s breath. It shows us that things are never solely good or bad but caught up in an elaborate ecology of life and death, creation and decay. Our momentary grief may well be the hummus for a later spurt of creativity or a better understanding or insight into the relations we maintain in our lives. In the same way the success we are enjoying now, is probably only a temporary tipping point before sliding off the edge of the circle once again. Just as Touch taught us that our shared vulnerability is what makes us human, this card tells us that the interdependence of all creatures is an invitation to give up living an ego centred life, and invest more in the creation of better circumstances for all. This is not an abstract concept, but a very concrete insight that can change our lives and make us more attentive to what surrounds us, and the consequences of our actions and life choices. On a personal and emotional as well as on a political and spiritual level. At the same time Breath also contains a warning. Just as strong emotions can sometimes prevent us from breathing, they can also form an obstacle to the embrace of a new cycle. By keeping us attached to loved ones, to things (the home, the possessions that make us happy, …) we become unable to move on and follow the lead of a new intuition. Therefore: take a good look at your emotions under the light of a full moon, in all its magical universal power. Can they live up to that promise? Or are they just masking a deeper lying fear, a hope that they will protect us from the boomerang effect of our previous actions, or the misery that comes with our unwillingness to accept the non-importance of our preciously nurtured ego’s?